If you are interested in supporting the 2018 International Tetrathlon Team, visit: HERE and select “International Exchange – Tetrathlon: Strassburger Fund” under the ‘Designation’ Tab. Its time to meet the US teams! Natalie is a Joint DC and C-2 Flat member of Portola Valley Pony Club in the Middle California Region. She was a member of the USA Pentathlon National Team. During that time, she trained at the Training Center in Fort Sam Houston, TX for four years and represented the USA during several National and International competitions. 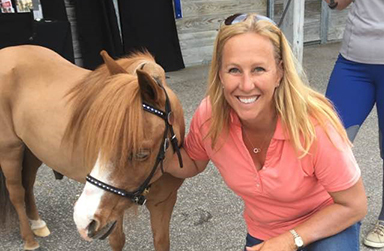 Natalie has been involved in Pony Club for 20 years, coaching her daughter and several other Pony Club members to many USPC Championships in Tetrathlon, Show Jumping, and Eventing. Her family hosted the U.K. Tetrathlon Team during the 2006 International Tetrathlon Exchange in Washington, D.C.. Natalie went on to join Pony Club as a Horsemasters member and won the Horsemasters division at the 2015 West Coast Tetrathlon Championships. Her best Pony Club memory is from when her daughter Caitlin passed her C-3 Traditional Certification at the age of 13. Natalie is looking forward to coaching the USPC Tetrathlon Team to their best potential during the 2018 International Tetrathlon Exchange.